The autofocusing is one of the most important features of imaging devices. This feature directly affects the quality of the image taken by the imaging device. Currently, many studies are being performed to improve the feature of autofocusing. In this study, we propose a method for passive autofocusing of the color cameras. This method suggested is called as the Passive Autofocusing Based-Brightness and Contrast (PA Based-BC). According to this method, autofocusing is performed by identifying the brightness of the R, G and B color components of the RGB image and by focusing of the camera on the brightest color component. To this end, in this study, many experiments have been conducted. The analyses of these experiments show that the contrast-based focusing made depending on the brightness gives much better results. The use of this method upgrades the focusing accuracy of the color camera up to 95%. R. Benes, P. Dvorak, M. Faundez-Zanuy, V. Espinosa-Duró, J. Mekyska, "Multi-Focus Thermal Image Fusion," Pattern Recognition Letters, vol. 34, no. 5, pp. 536-544, 2013. D. Wang, X. Ding, T. Zhang, H. Kuang, "A Fast Auto-Focusing Technique for the Long Focal Lens TDI CCD Camera in Remote Sensing Applications," Optics and Laser Technology, vol. 45, pp. 190-197, 2013. J. Kautsky, J. Flusser, B. Zitova, S. Simberova, "A New Wavelet-Based Measure of Image Focus," Pattern Recognition Letters, vol. 23, no. 14, pp. 1785-1794, 2002. S. Wu, W. Lin, L. Jiang, W. Xiong, L. Chen, "An Objective Out-Of-Focus Blur Measurement," Information, Communications and Signal Processing, 2005 Fifth International Conference on, pp. 334-338, 2005. S. Pertuz, D. Puig, M. A. Garcia, "Reliability Measure for Shape-From-Focus," Image and Vision Computing, vol. 31, no. 10, pp. 725-734, 2013. C. Y. Chen, R. C. Hwang, Y. J. Chen, "A Passive Auto-Focus Camera Control System," Applied Soft Computing, vol. 10, no. 1, pp. 296-303, 2010. S. H. Jin, J. U. Cho, J. W. Jeon, "FPGA Based Passive Auto Focus System Using Adaptive Thresholding," in Proceedings of SICE-ICASE International Conference, pp. 2290-2295, 2006. J. Widjaja, S. Jutamulia, "Wavelet Transform-Based Autofocus Camera Systems," in Proceedings of The 1998 IEEE Asia-Pacific Conference on Circuits and Systems, pp. 49-51, 1998. I. H. Lee, S. O. Shim, T. S. Choi, "Improving Focus Measurement via Variable Window Shape on Surface Radiance Distribution for 3D Shape Reconstruction," Optics and Lasers in Engineering, vol. 51, no. 5, pp. 520-526, 2013. E. Turgay, O. Teke, "Autofocus Method in Thermal Cameras Based on Image Histogram," 2011 IEEE Conference on 19th Signal Processing and Communications Applications, pp. 462-465, 2011. S. B. Roh, S. K. Oh, W. Pedrycz, K. Seo, "Development of Autofocusing Algorithm Based on Fuzzy Transforms," Fuzzy Sets and Systems, vol. 288, pp. 129-144, 2016. C. Zhou, X. Hu, Y. Zhou, "An Induced Fluorescence Detecting System with Autofocus Electrically Tunable Len", IACSIT International Journal of Engineering and Technology, vol. 8, no. 4, pp. 297-300, 2016. Y. Zhang, Y. Zhang, C. Wen, "A New Focus Measure Method Using Moments," Image and Vision Computing, vol. 18, no. 12, pp. 959-965, 2000. M. Subbarao, J. K. Tyan, "Selecting the Optimal Focus Measure for Autofocusing and Depth-From-Focus," IEEE Transactions on Pattern Analysis and Machine Intelligence, vol. 20, no. 8, pp. 864-870, 1998. W. Huang, Z. Jing, "Evaluation of Focus Measures in Multi-Focus Image Fusion," Pattern Recognition Letters, vol. 28, no. 4, pp. 493-500, 2007. L. Fan, F. Song, S. Jutamulia, "Edge Detection with Large Depth of Focus Using Differential Haar-Gaussian Wavelet Transform," Optics Communications, vol. 270, no. 2, pp. 169-175, 2007. D. M. Tsai, C. C. Chou, "A Fast Focus Measure for Video Display Inspection," Machine Vision and Applications, vol. 14, no. 3, pp. 192-196, 2003. H. C. Chang, T. M. Shih, N. Z. Chen, N. W. Pu, "A Microscope System Based on Bevel-Axial Method Auto-Focus," Optics and Lasers in Engineering, vol. 47, no. 5, pp. 547-551, 2009. M. Selek, "An Adaptive Squared Gradient Algorithm for Autofocusing of Thermal Cameras," International Journal of Innovative Computing Information and Control, vol. 9, no. 2, pp. 841-849, 2013. I. Lee, M. T. Mahmood, T. S. Choi, "Adaptive Window Selection for 3D Shape Recovery from Image Focus," Optics and Laser Technology, vol.45, pp. 21-31, 2013. 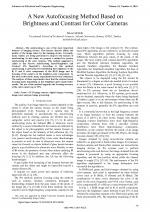 M. G. Chun, S. G. Kong, "Focusing in Thermal Imagery Using Morphological Gradient Operator," Pattern Recognition Letters, vol. 38, pp. 20-25, 2014. O. Lossona, L. Macairea, Y. Yanga, "Comparison of Color Demosaicing Methods," Advances in Imaging and Electron Physics, vol. 162, pp. 173-265, 2010. P. M. Hubel, J. Liu, R. J. Guttosch, "Spatial Frequency Response of Color Image Sensors: Bayer Color Filters and Foveon X3," Sensors and Camera Systems for Scientific, Industrial and Digital Photography Applications V Proc. SPIE, vol. 5301, pp. 402-407, 2004. X. Li, B. Gunturk, L. Zhang, "Image Demosaicing: a Systematic Survey," Visual Communications and Image Processing Proceedings SPIE, vol. 6822, 2008. Z. Sadeghipoor, Y.M. Lu, S. Süsstrunk, "Optimum Spectral Sensitivity Functions for Single Sensor Color Imaging," in Proceedings of SPIE Conference on Digital Photography VIII, vol. 8299, 2012. X. Xu, Y. Wang, J. Tang, X. Zhang, X. Liu, "Robust Automatic Focus Algorithm for Low Contrast Images Using a New Contrast Measure," Sensors, vol. 11, pp. 8281-8294, 2011. S. Podlech, "Autofocus by Bayes Spectral Entropy Applied to Optical Microscopy," Microscopy and Microanalysis, pp. 1-9, 2016. R. O. Panicker, B. Soman, G. Saini, J. Rajan, "A Review of Automatic Methods Based on Image Processing Techniques for Tuberculosis Detection from Microscopic Sputum Smear Images," Journal of Medical Systems, vol. 40, pp. 1-13, 2016. X. Zhang, H. Wu, Y. Ma, "A New Auto-Focus Measure Based on Medium Frequency Discrete Cosine Transform Filtering and Discrete Cosine Transform," Applied and Computational Harmonic Analysis, vol. 40, pp. 430-437, 2016. X. Zuojiang, H. Di, Z. Haibin, W. Liang, X. Zhigang, "Research on Automatic Focusing Technique Based on Image Autocollimation," Optik-International Journal for Light and Electron Optics, vol. 127, pp. 148-151, 2016. B. Neumann, A. Dämon, D. Hogenkamp, E. Beckmann, J. Kollmann, "A Laser-Autofocus for Automatic Microscopy and Metrology," Sensors and Actuators, vol. 17, no. 1-2, pp. 267-272, 1989. N. Kehtarnavaz, H. J. Oh, "Development and Real-Time Implementation of A Rule-Based Auto-Focus Algorithm," Real-Time Imaging, vol. 9, pp. 197-203, 2003. M. Gamadia, N. Kehtarnavaz, K. Roberts-Hoffman, "Low-Light Auto-Focus Enhancement for Digital and Cell-Phone Camera Image Pipelines," IEEE Transactions on Consumer Electronics, vol. 53, no. 2, 2007. S. Y. Lee, J. T. Yoo, Y. Kumar, S. W. Kim, "Reduced Energy-Ratio Measure for Robust Autofocusing in Digital Camera," IEEE Signal Processing Letters, vol. 16, no. 2, pp. 133-136, 2009. H. D. Cheng, X. H. Jiang, Y. Sun, J. Wang, "Color Image Segmentation: Advances And Prospects," Pattern Recognition, vol. 34, pp. 2259-2281, 2001. F. C. A. Groen, I. T. Young, G. Ligthart, "A Comparison of Different Focus Functions for Use in Autofocus Algorithms," Cytometry, vol. 6, pp. 81-91, 1985. J. W. Han, J. H. Kim, H. T. Lee, S. J. Ko, "A Novel Training Based Auto-Focus for Mobile-Phone Cameras," IEEE Transactions on Consumer Electronics, vol. 57, no. 1, pp. 232-238, 2011. S.Y. Lee, Y. Kumar, J. M. Cho, S. W. Lee, S. W. Kim, "Enhanced Autofocus Algorithm Using Robust Focus Measure and Fuzzy Reasoning," IEEE Transactions on Circuits and Systems for Video Technology, vol. 18, no. 9, pp. 1237-1246, 2008. J. Lee, K. Kim, B. Nam, "Implementation of a Passive Automatic Focusing Algorithm for Digital Still Camera," IEEE Transactions on Consumer Electronics, vol. 41, no. 3, pp. 449-454, 1995. Y. Sun, S. Duthaler, B. J. Nelson, "Autofocusing in Computer Microscopy: Selecting The Optimal Focus Algorithm," Microscopy Research and Technique, vol. 65, no. 3, pp. 139-149, 2004. M. Kristan, J. Pers, M. Perse, S. Kovacic, "A Bayes-Spectral-Entropy-Based Measure of Camera Focus Using a Discrete Cosine Transform," Pattern Recognition Letters, vol. 27, pp. 1431-1439, 2006. 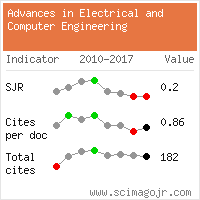 Citations for references updated on 2019-04-20 19:00 in 276 seconds. Website conception, design and maintenance by Eugen COCA. Content updated on 28 Feb 2019. Site engine updated on 28 Feb 2019. This page was generated on the server in 0.088 seconds and loaded in your browser in > seconds.